Young people, individuals and organisations, which demonstrate excellence in the UK’s cultural sector, were celebrated last night [1 April] at a glittering awards ceremony dedicated to the industry’s unsung heroes. 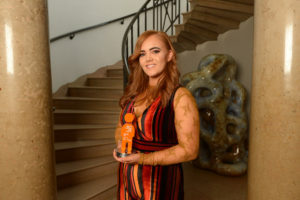 Apprentices, interns and mentors were among those recognised at the seventh annual Creative & Cultural Skills Awards, held in Cardiff for the first time at the National Museum Cardiff. This year, two young women were jointly awarded the prestigious title of ‘Apprentice of the Year’ for their exceptional commitment and ambition to learning new skills. Judges were unable to choose between the drive shown by Fionnuala Cush, 25, in her role at Cultúrlann McAdam Ó Fiaich – an Irish language, arts and cultural centre in West Belfast, and the leadership skills of Sophie Hukin, 22, of SharpFutures in Manchester – a social enterprise that supports diverse young people into employment in the creative digital and tech sectors. Ms Cush began her apprenticeship on the centre’s welcome desk but, after seeking out additional training and attending courses and night school, began proactively seeking greater responsibility before being appointed business development officer – a role created specifically for her. 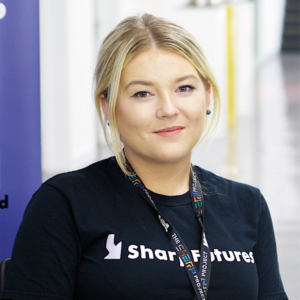 Meanwhile, Ms Hukin has helped SharpFutures close the social mobility gap for young people who want to break into the creative digital and tech sectors but have no work experience and minimal connections. Her achievements include promoting ways for young people to access employment in the sector and advising students on pathways to long-term work. Ms Hukin added: “My apprenticeships at SharpFutures opened the door to a career in a sector I love. I enjoyed every moment of my time as an apprentice so to get this award is just the icing on the cake. More than 200 people attended this year’s awards and dinner, which were presented by Angharad Lee, a freelance director of theatre, opera and film, and David Anderson, director general of National Museum Wales. Entertainment was provided by Rubicon Dance, a community dance development organisation for Cardiff and Newport. Recent research published by Creative & Cultural Skills reveals that there were 1,175,546 people working in the creative industry in the UK in 2018, with 25% of these aged between 16-29 years old, in sectors as diverse as literature (31%), performing arts (21%), visual arts (15%), cultural heritage (13%), design (13%), music (4%) and craft (3%). Simon Dancey, chief executive of Creative & Cultural Skills, said: “To be a part of this inspirational event, surrounded by individuals and organisations working passionately to shift the persisting inequalities in the UK’s cultural sector, has been a privilege. “Both Fionnuala and Sophie demonstrate the value apprenticeships can provide both to those who may not do well academically but thrive in the right setting, and to the creative sector generally. “Our awards are about celebrating people who demonstrate the skills, passion and commitment required to make lasting change to the organisations they work for – regardless of their academic background.